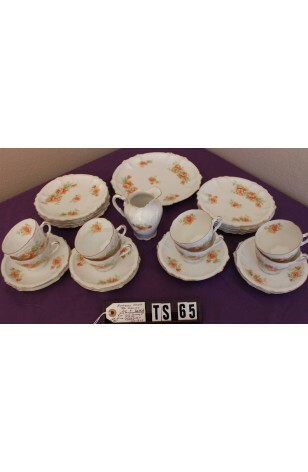 Antique - Bavarian Tea Set, 26 Pieces, a Service for (8) Eight, in a Floral Pattern of Orange, Made from 1850's to 1870's. Beautiful Victorian Era, Bavarian, Hand Painted Tea Set for Eight, Boasting lovely Orange Flowers and 2-toned Green Foliage. The China is Scalloped, Fluted, Embossed and trimmed in 22kt Gold. Cups and Creamer both have Scalloped Feet and the Interior of the Cups also have a Flower bouquet. This is a Tea Set from the Mid-1800's, and in very good condition for its age. Some minor wear and small chip on one saucer. Beautiful Victorian Era, Bavarian, Hand Painted Tea Set for Eight, Boasting lovely Orange Flowers and 2-toned Green Foliage. The China is Scalloped, Fluted, Embossed and trimmed in 22kt Gold. Cups and Creamer both have Scalloped Feet and the Interior of the Cups also have a Flower bouquet. This is a Tea Set from the Mid-1800's, and in Good Resale Condition for its age. Having some minor wear and small chip on one saucer. 8 - Saucers - 5 3/4"